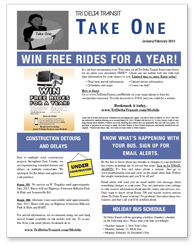 "Take One" is a newsletter published every other month by Tri Delta Transit. This newsletter includes information about holiday service, service changes, promotions, and other news that directly affects passengers. The newsletter is available on all Tri Delta Transit buses, at Tri Delta Transit's administrative office (801 Wilbur Avenue, Antioch), and online. Thank you for reading "Take One"!